The Simpsons have come to play, and they are breaking all the rules! First, when Mayor Quimby rescinds the order for Daylight Saving Time in Springfield, a loophole in the city charter causes a time zone free-for-all! Then Homer recalls his Happy Days when he had to choose between his high school sweetheart and a lovely young debutante, who also happens to be Mr. Burns' niece. Also, after Marge takes pity on him, Ned Flanders moves in with the Simpsons, and his goody good-diddly-ness, makes everyone as pleased as punch (except for Homer)! 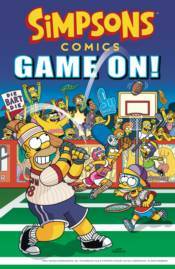 Get your 'Game On!' with the Simpsons!